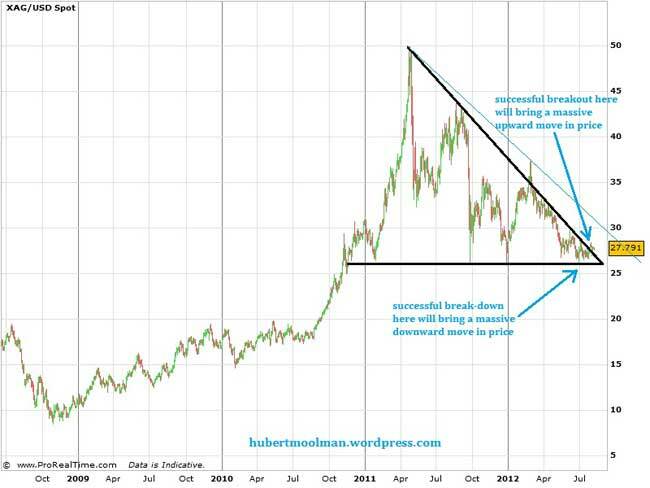 The silver chart has formed a big pennant like that of the gold chart. 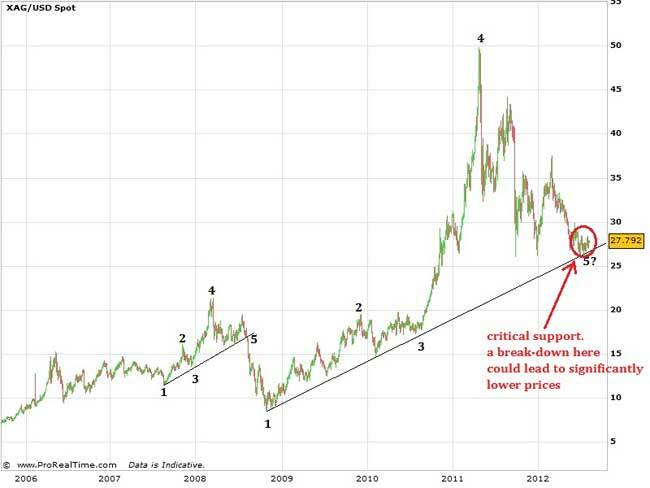 What this indicates is that the silver price will likely make a massive move soon. Technically, this move can be up or down. Note that this update is from my premium service originally published on 6 August 2012. The technical and fundamental evidence that I have collected, and look at, tells me that the price is likely to go upward out of this pennant formation. On the chart above, you can see that the price has actually broken out (upward) of the pennant. We have to give it some time before we can say that it is a valid breakout. Also, I have drawn a blue line, which could become another area of resistance. If we were to consider a move down, then a first target of $15 and one lower at $5 would come into play, based on the patterns. A price of $5 (and even $15) does not make any economic sense, given the amounts of fiat money currently available. However, there is a real threat of deflation, currently, and the effect of this has to be considered when looking at the future silver price. In my opinion, we do have a perfect setup for a massive deflation which will destroy a lot of debt-based value. Stock market values have been driven for years by this debt-based value, and will, therefore, be very badly devalued. Many believe that such a fall in stock market values will take down the silver price. I do not agree, and have given many reasons why. Here, I would just like to point out that the current threat of deflation is due to the massive debt levels, and the inability to service those debt commitments. You can just look at the example of Spain or Greece. Silver is a real store of value and that is its most significant function. The current crisis will cause a massive rush to that which can store value that will not be destroyed by the debt-collapse. Silver is just about the opposite of debt. Previously, I wrote about how this debt-based monetary system has created what I call a “mirror-effect”, whereby, silver (and gold) is pushed down in value, to a similar extent as to which paper assets such as general stocks are pushed up in value. This mirror-effect clearly shows up on the long-term charts of gold, silver and the Dow. I have drawn a vertical red line, approximately where silver was demonetized (1870s). Notice how the real price of silver collapsed after the red line, from about $30, until it bottomed in 1931 at $4.29. It then traded side-ways (from the big-picture view) for many years, until it spiked from about the early 1970s, making a peak in 1980, where after, it bottomed again in 2001. Technically, the bottom in 2001 was the completion of what would be a remarkable double bottom reversal, with the first bottom being in 1931. After a double bottom formation, there is often a big rally, and that is exactly what happened next. If this pattern continues to follow the pattern of a valid double bottom, it will reach levels that will exceed the 1980 high by at least one multiple, but probably by many more. 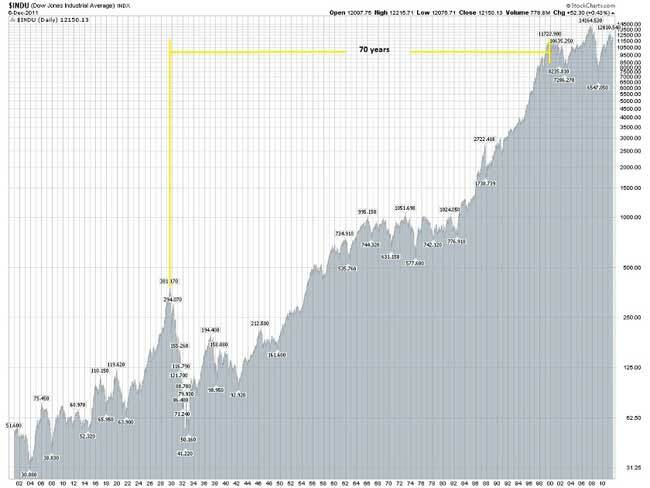 On the chart, I have indicated a 70 year period from when the Dow peaked in 1929, to the peak in 1999. The reason for using the 1999 peak instead of the 2007 peak, is the fact that the 1999 peak represents the real peak, since the Dow/Gold ratio peaked in 1999 (like it did in 1929). 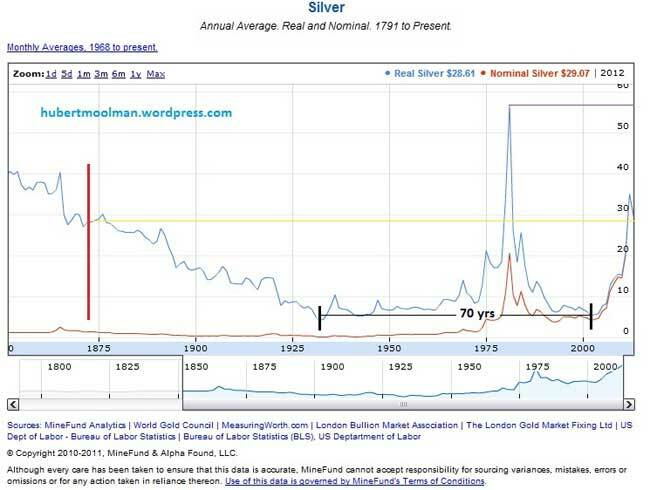 Notice the dates of the peaks and how they fit in with that of the bottoms of the real silver price, as well as the similar 70 year periods between. In my opinion, the occurrence of the 70 year period on both charts, in the context as explained above, provides additional evidence of the link between silver’s demonetization (or suppression) and the massive debt bubble of this century – as explained in part 1 of this article. While the Dow is inflated to the peak in 1929, silver is suppressed to its low in 1931. And again, the Dow is inflated to its peak in 1999, while silver is suppressed to its bottom in 2001. So, the peaks and troughs, as presented in the above charts, are the manifestation (in visual form) of the debt-based monetary system causing paper and related assets to rise, while suppressing silver. Another way of looking at it is that the debt-based monetary system is fuelling speculation in paper assets by using energy diverted from precious metals. Silver (like gold) stands in direct opposition to the current monetary system (they are inescapably linked). The fall (and falling) of this system is the rise of silver as money; therefore, massive increases in what silver can buy in real terms. I have highlighted two fractals by indicating 4 similar points on both. Based on this comparison, we could now be at a very critical area. A break-down below the support (about $26), could mean that the current pattern could follow the 2007/2008 pattern, and take price much lower. This is presented not because I believe that price will break lower than the support, but to show why I think we are at a critical level, and why we should be watchful. This comparison is still very much valid; only if price goes lower than $26 could it become invalid. In fact, there is a good chance that price has broken out to the upside. On both charts, I have suggested how the flag patterns might be similar, by marking similar points, from 1 to 6 (and alternatively from a to h). 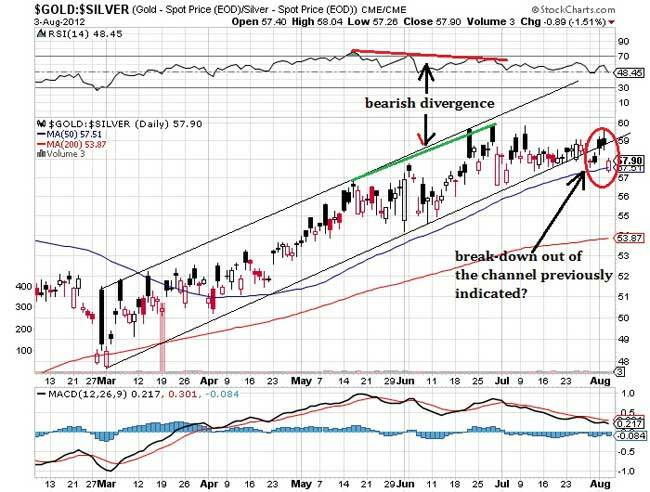 Based on this comparison, it appears that the silver price might now have found that point 6 or h (at the end of June), and is about to increase significantly. We could be at very volatile area due to the possible breakout, since this is often the case after a breakout – so be aware! I am of the opinion that silver should make its move higher between now and the end of this month, if this comparison is to be confirmed. On the chart I have indicated a trading channel in which the ratio has been moving for the last five months. It appears now to have finally broken down, out of the channel. 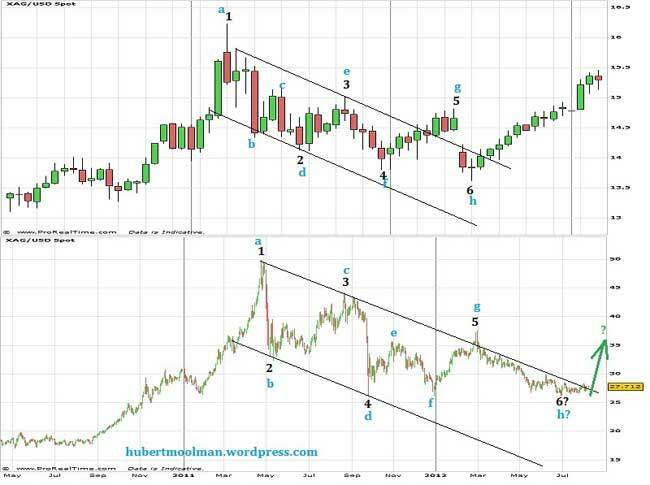 This could be a very strong signal that silver and gold prices are about to rise significantly. Again, here we have to watch for a possible retest of that break-down area, before the ratio falls straight down. For more of this kind of analysis on silver and gold, you are welcome to consider my premium service. I have also recently completed a Long-term silver fractal analysis report . Silver appears to have broken out of the pennant or flag-type formation, and could now finally be setting-up for a massive rise in price. We should, however, be very watchful, due to the fact that we are at a critical area in price and time. There is a big threat of deflation, but, in my opinion, it is this very deflation (brought about by the collapse of the debt bubble) that could be driving silver prices higher.